Hot on the heels of the new Zappi charger launch, Lincolnshire based smart energy company MyEnergi have announced the launch of their keenly awaited mobile app and hub. Once installed, users will be able to monitor the energy use within their house as well as control smart power diverting devices like the Zappi and Eddi products. Zappi allows excess power from renewable energy sources, such as Solar PV or a Wind Turbine, to be redirected to charge an Electric Car rather than be exported to the National Grid. Eddi diverts excess power into an immersion heater within a hot water cylinder heating the water for free. A pre-requisite for the app to work in the brand new Myenergi Hub which retails for £85. This new hub brings together the Zappi and Eddi real time status as well as the ability to monitor energy flows from Renewable Energy sources, the grid and even connected Battery Storage devices such as the Tesla Powerwall 2. 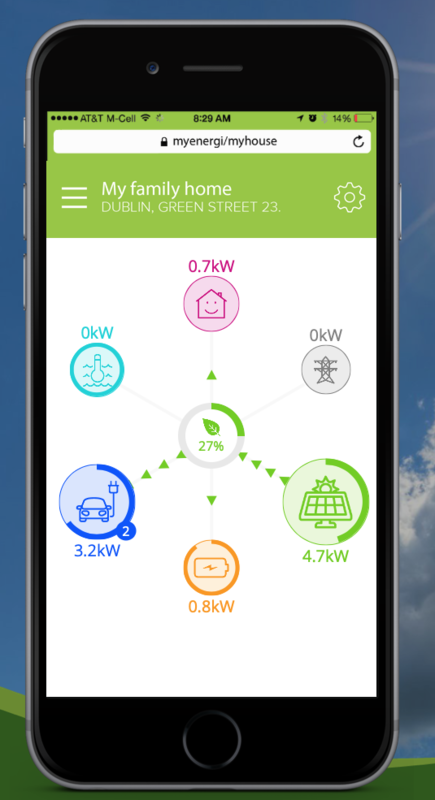 The look and feel is very similar to the Tesla mobile app which has a dependency on having either a Tesla car or Powerwall device whereas the Myenergi app monitors energy flows by simple CT clamps meaning users can choose any brand of Battery Storage or solar panels.